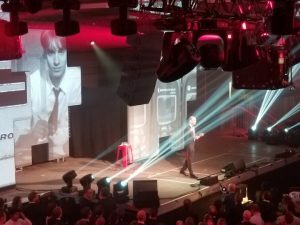 Riedel Communications last week celebrated its 30th anniversary, and the event — which was capped off with a massive celebration at company headquarters in Wuppertal, Germany — gave founder/CEO Thomas Riedel a chance to reflect on what has been and what lies ahead for the company. Thomas Riedel greets revelers at Riedel Communications’ 30th-anniversary party. He tends to approach plans in five-year increments although he is the first to admit that, five years ago, he never would have envisioned the scale of what has happened to both the company and the industry. When it comes to the future, Riedel believes in investing in engineering (the R&D team will grow from 85 to 100 by the end of next year) and listening to customers and the market. Recent investments in RF, for example, have led to new wireless products and expanded the company’s place in the communications business. “I can’t remember a product where so many people have come back with nice comments about something boring like an intercom,” he says. Tactical acquisitions also play a part, such as acquiring Mediornet in 2009. Two years of intense development and financial investment without a revenue stream resulted in a product line that has transformed the company and placed it squarely in the signal-routing, processing, and fiber-optic transport business. Today, Mediornet is the company’s second-biggest area of business, and its technologies are at the center of major global broadcasts, including the Olympics, World Cup, and Eurovision Song Contest. It is also found in many remote-production trucks, where it has replaced traditional routing switchers. According to Riedel, the industry transition is causing a shrinking of some of the business opportunities, but he sees that challenge as an opportunity, creating a demand for new solutions and new businesses. Event security and the need for more-reliable communication systems is one way Riedel Communications’ customers are extending out of the TV compound and into venue and event operations. More clients are allowed to leverage a single Riedel network topology. The company is also working with the family of Adidas founder Adi Dassler on a startup accelerator called leAD that is for young companies working with sports-related technology. Another area of growth is esports and egaming. Riedel Communications is working with the likes of the Riot Games and ESL to help develop the format and to also be relevant to that market. One area that has shrunk a bit is the rental market, which now accounts for about 40% of Riedel Communications’ business. That is down from a peak of about 50%, partly because the company is avoiding competing with rental companies that are also its clients. Looking to the future, Riedel sees automated processes playing a bigger role for things like camera shading and even audio mixing. But those processes, he notes, will still require human operation to add the artistic element. The 30th-anniversary celebration, he adds, is part of a larger strategy and, in hindsight, exemplified that commitment to engineering and the artistic. Technologies like robotics and programmable displays and projection systems opened up a pathway for artistic elements to shine.